No, I’m not putting down those in the noble profession of firefighting—those brave souls who risk their lives every day to save ours. I didn’t mean those firefighters. On second thought maybe my headline should have been “if you can’t be a firefighter, don’t be a fire-fighter”. Eh? Maybe not. The truth is, there will always be sudden issues that come up that you do need to address that will take your quick thinking and quick response. While marketing your business probably isn’t saving lives, it isn’t immune to the occasional urgent matter popping up from time to time. Most of the business managers and owners I know realize marketing is an important piece of their business, but when things get busy, marketing usually takes a back seat. You can put off preparations for that upcoming trade show or wait until tomorrow to proof that ad or send out that email newsletter next week, but before you know it, the deadline will be here and you’ll be in a panic. When you are under a deadline and in a panic—that’s when mistakes happen. It’s also when you forget to look at the big picture, you lose sight of the strategy behind your decisions, and you forget about your goals. And that’s unfortunate, because that’s why you are marketing in the first place, right? Is it a fire? Do you really need to address this now or is it simply because a competitor is doing it? Is fast a better alternative to strategic? Is it better to have a “good enough” project or should you take the time to get it done right the first time? Is it more important than what you are currently working on? Is it that hot that you should drop everything and address this instead? I’m guessing that the few seconds it takes you to think through these three questions will help you make the best and more strategic decision. One you probably won’t regret later. And by all means, if there is an actual fire flaming in your office, put it out! Better yet, call the pros. 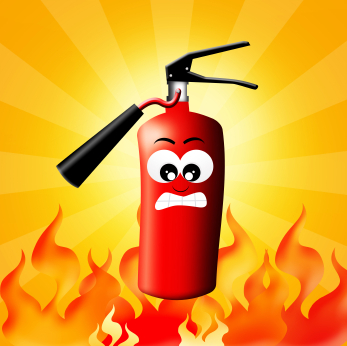 Got a marketing “fire” you need help with? Call EVH Marketing today.